A very quick and easy pasta recipe from Umbria. You will be able to prepare this any time you wish and in a few minutes. Ingredients: One onion, 200 grams of bacon, salt, 350 grams of peeled tomatoes, 400 grams of spaghetti pasta, a small bunch of marjoram, grated pecorino cheese, pepper and olive oil. Preparation: Dice the onion and the bacon then let saute on slow heat with a little olive oil. When the onion is brown and the bacon nicely melted, add the crushed peeled tomatoes with their liquid. Keep on cooking with the lid partially on over medium-low heat. Add salt to taste and stir every now and then. The tomato will be done when it turns its color from vivid red to a more brownish tint. When done, turn off the heat and ad the minced marjoram. 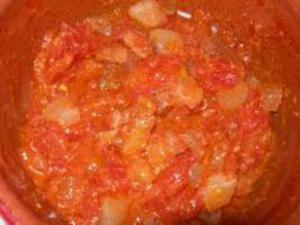 While the tomato is cooking, fill a pot with about 3 liters of water, add salt to taste, then set on high heat until boiling. Then add the spaghetti pasta and cook as long as indicated on the packaging. When done (make sure to have the sauce ready at this stage) remove fromo heat and with a colander drain the pasta. Set it on the sauce and mix gently while adding the grated pecorino cheese. Buon appetito! PS: It goes without saying that any type of pasta can be paired with the sauce. It is just that spaghetti are an excellent match.